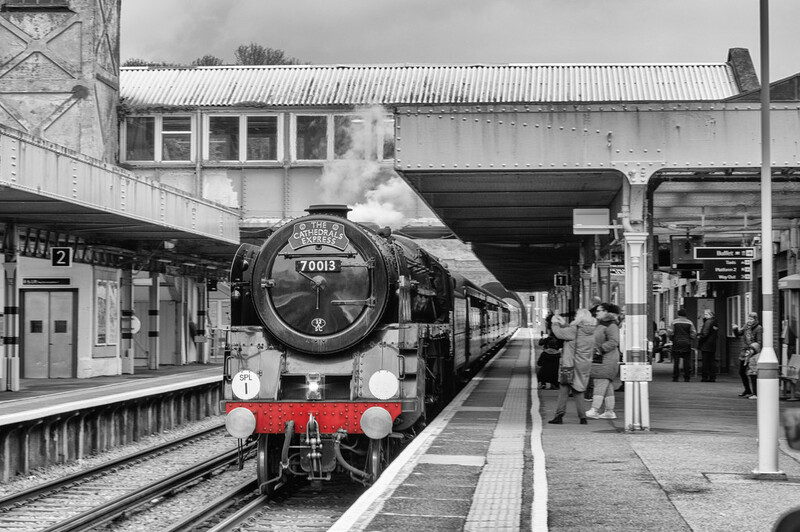 The Cathedrals Express organised the trip of this 67 year old steam train making its way across Kent today, carrying passengers celebrating Valentine's Day with a romantic trip down memory lane. The train is the 70013 Oliver Cromwell, a Britannia Class locomotive built in 1951. Its top speed is 100mph but it's now restricted to 75mph. I was very glad I arrived at Dover Priory early - two blinks and I'd have missed it! oooh love this, like a cross between the 1940's and today...FAV! Wonderful! I spend happy hours in our National Railway Museum gazing in awe at these majestic old engines. When I grow up I'm going to be an engine driver driving Mallard. They say if I can get him in my bag I can bring him home. Where is Mary Poppin's bag when you need it??? Lovely image, the flash of red is super. A beautiful old railway pic. Love those trains. Fav. oh well done for catching this as it flashed by. what a lovely image. ah that works so well for the theme! Great idea and pop of red! Imagine 100 MPH on one of these beauties. Good shot. A great flash of red! A beauty! Fav. I remember how wonderful it was when walking across the bridge to school in the 1960's when a steam engine passed underneath. Not much in this picture would have been different in that era, just some of the clothing. Wow! Historical Valentine's Day ride! I love your pop of red and the comp is spot on. Beautiful capture of this lovely old train! This was an instant fav for me! Good job! Trains are awesome! I want to ride it! Book me a ticket!!! Fabulous old steam-train. Wonderful shot for FoR. Great photo and the flash of red is perfect. Happy Valentines Day. Fabulous shot and perfect for the flash of red. It is always nice to see these old steam engines on the tracks again. fav. Fantastic photo of the Oliver Cromwell. Such an iconic train of that last era of steam. Must tag a friend who adores trains.... @peadar - take a look at this! Okay, practical question: how do you get the black and white with just a little bit of red? Is that a Photoshop thing? I don't have that program. Just wondering because I love the effect but have no idea how to do it. @casablanca I use Photoshop Elements 11. I picked it up on EBay a few years back and just seen version 12 up there for under £20. There are lots of videos on YouTube showing you how to use it and you can also get Elements for Dummies books. You get the selective colouring by using layers by making a copy of the original picture, changing the copy to b&w and then using the eraser tool to rub out the b&w bit you want so that the colour from the original pic shows through. You then merge the two pics together. Sounds far more difficult than it is! The best bit about having Elements is that you can use the free Nik filters download with them. I use these all the time. They make colours sing and b&w pop. I guess it is 'cooking' from a purist's viewpoint but with my limited camera skills, my pics need all the help I can give 'em! @fbailey Thanks for the info. I did try to load Elements 11 onto my Mac but it wouldn't run. I have a program called Affinity by Serif and it may well have a similar thing, but I don't understand all the jargon yet so I haven't found it!! I used to be utterly opposed to editing and I still prefer to use shots straight out of the camera, but editing can create a different kind of artwork and it's fun playing with it. The only thing I can't stand is people pretending they haven't edited when they have!! I shall have to go and explore this idea further and see if I can achieve it somehow. Many thanks! This is probably one of my favorite flashes of red today! Excellent. Love the flash of red in it. Great capture. I live in York and one day trying to find a parking space, I looked up to see the Flying Scotsman, in steam passing on the raised track overhead. Wonderful memory, but that's all, I didn't have my camera with me. Yes I've done that one too!